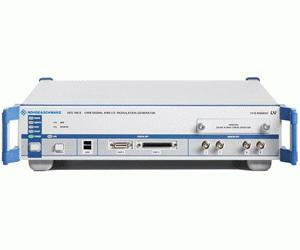 The R&S AFQ100B with a bandwidth of 528 MHz (RF), a clock rate of 600 MHz and a waveform memory of up to 1 Gsample is the correct choice for applications that require high bandwidth. Examples are the support of broadband digital communications systems such as UWB (ultra-wideband) or Aerospace & Defence (A&D) radar applications where signals with extremely short pulses and short rise and fall times might be needed. Digital standards like WCDMA, LTE, HSPA, WiMAX, WLAN, MB-OFDM UWBÜusing WinIQSIM2""
R&S?MATLAB transfer toolbox for easy interoperability with MATLAB?